eToro is one of the better known social trading platforms out there and today we are going to be taking a look at the product at the core of their social trading platform which is their Openbook offering. The Openbook is the home of social trading at eToro and is where all of the companies social trading features can be accessed. On opening up the Openbook platform the trader is greeted with a screen which displays the traders eToro rates the best. You can further search through these traders and categorize them by risk and other variants, allowing you to eliminate some of the higher risk traders in order to find someone to follow who is suitable for your needs. 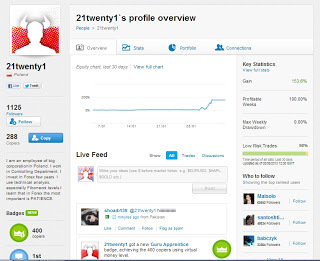 Each trader who allows followers has a profile page which is quite similar in way to Facebook. At the top of the page is the traders recent performance and various over stats that prospective followers maybe interested in. 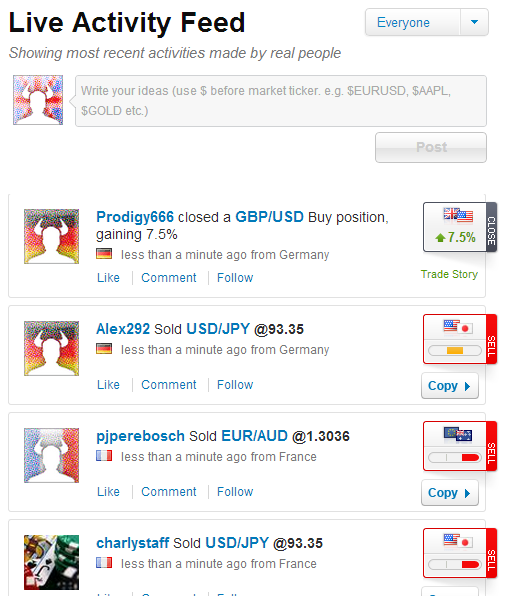 You can also see what connections the particular trader has with other people on the eToro network. 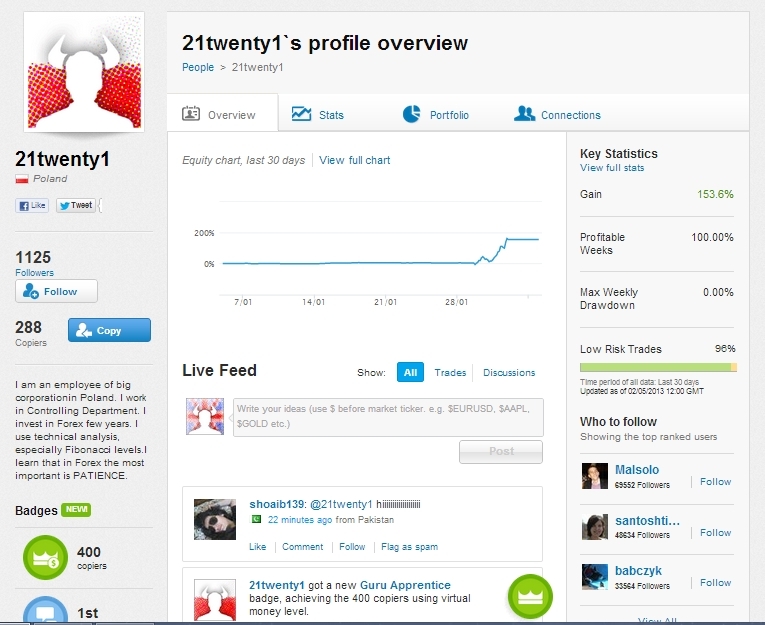 Below this the individual’s live feed which acts a bit like a Facebook profile wall and allows people to post comments to their wall and updates whenever the trader opens a new position. In addition to there being profiles for each trader who uses eToro’s social trading platform to either trade or gather followers, there is also the general live activity feed which features all the current social trading activity on the eToro platform and updates in real time. This updates with information about various traders opening and closing positions, as well as showing who has followed who into a trade. Much like how each trader has it’s own profile each instrument has a page where various traders in the eToro social trading network can leave comments and opinions on which way the instrument is going to move. As well as looking at charts of the instruments recent performances, this has never been particularly helpful for me personally as I haven’t found many particularly insightful comments left. The eToro Openbook social trading platform is very easy to use and should be simple enough to use for anyone who has had previous experiences with social networks. It is partly this reason why it has become some popular for those who wish to easily follow and copy successful traders. As with any type of trading there are significant risks and I have talked about the dangers of the eToro Copytading before. Using the eToro Openbook platform is a breeze, the difficult part is choosing who to follow, as not a huge amount of information is provided regarded the previous performance of a particular trader. Though it is possible to do some deeper research and go back through the traders past trades and determine what kind of strategy they use. Though there does seem to be a number of highly successful traders operating on the eToro platform which means there are probably some decent opportunities making money from simply following the activities of others. Both zulutrade and etoro have their own benefits , but i personally preffer zulutrade as i find it a more complete package for both the investors and the signal providers. It feels more professional too. I personally prefer ZuluTrade as well. Both platforms have potential for those who want to get into social trading and I agree that ZuluTrade is the more professional outfit. That being said I reckon a lot of new traders may find themselevs more comfortable at eToro. Don't get me wrong, I very much like eToro and have an account with your company, eToro feels much more like social network of investing compared with ZuluTrade and has a more friendly user interface. I'd like more ability to dig into traders stats and their previous positions etc. but would have to say your doing a very good job! I'm excited to hear about your new features you will be launching soon. I am still curious why people bother to talk about etoro…I've been there, done that, not a funny picture, lost all my money in no time. Who cares about the social aspect, when the whole point is to win…and i was loosing? 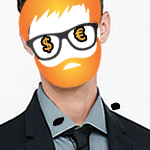 !…anyhow guys, only zulutrade will actually make you money. I'm going to do a piece regarding eToro Openbook and see whether its possible to make money using their system. I'm in the progress of a piece regarding my experiences with ZuluTrade and I have to say if you do your research regarding the signal providers at ZuluTrade it does seem like you can make some serious cash. Its unfortunate to hear about your experience at eToro, could you elaborate and explain what exactly happened?